Director Atlee who is known for his poetic on-screen romantic scenes seems to be a lovey-dovey husband off the screen as well. He is married to Priya since 2014, and they seem to be very much in love. 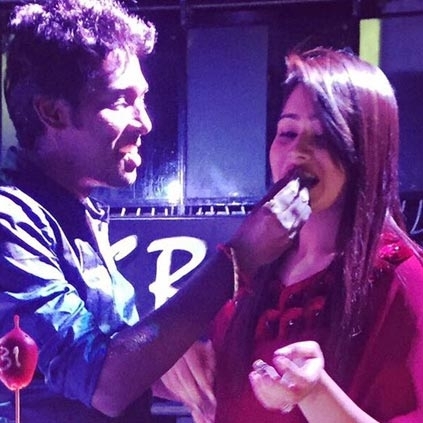 Atlee celebrated his birthday yesterday with Priya and she took to her Twitter space to show how much Atlee means to her, "U r a blessing tat could ever happen to me,I wish u all luck n I promise I will b beside u to support u forever❤️happy bday papa @Atlee_dir". Atlee was quick to reply, "Thank you god for giving me @priyaatlee she is my strength ,love and everything love u @priyaatlee it was a most remembered day of life ❤️"
FIRST ON NET: VIJAY’S MERSAL TEASER REVIEW! Vijay’s much awaited Mersal teaser is here. The film directed by Atlee seems to be ‘packaging at its best’. In simple terms, Atlee’s presentation with Thenandal Studios Limited’s production value and Thalapathy Vijay’s screen presence clubbed together by an amazing technical team, serves a treat for film fans. The teaser starts off with a revenge based punch dialogue that Vijay delivers in his stylish voice. From there on, grand visuals, amazing cuts, pompous sequences, stylish action blocks, the Mersal teaser has a lot more to offer. The 1 minute 15 seconds long teaser features Vijay in both his looks. One that has him in the flashback with the twirled moustache and beard and the other in his usual trim look. The parts that feature him as the magician are extremely stylish and have him doing tricks with cards and a pigeon. These could become hot favorite scenes among fans along with 'Peace Bro' picking up as a chiller among youngsters. The background score by AR Rahman seems very attractive too. Another interesting point to note is the Bairavaa connect in this Mersal teaser. Just as Vijay handles the coin in Bairavaa, here, Vijay is seen handling a glass marble. This features right at the start of the teaser. The parts with Vijay in his flashback look would guarantee goosebumps as there seems to be enough mass sequences, packaged well with content that has the potential to deliver. GK Vishnu’s work as a cinematographer requires praise and Ruben’s cuts are a big bonus to this teaser. Ruben’s work is such that, he has given a ‘blink and you will miss this event’ format of edit for the teaser. On the whole, the teaser is Vijay all the way backed up excellently by the strong technical team. Atlee and Vijay’s combination after Theri seems to be bigger and better, this time with Mersal. A special kudos to Thenandal Studios Limited for weaving out such a grand project that could serve as a festival during it’s release for the fans of Tamil cinema. Mysskin’s Associate Director A.Priyadhaarshini Announces Her First Project Starring Varalaxmi Sarathkumar. Mersal - Aalaporan Thamizhan Song Reaches One Crore People! People looking for online information on Atlee, Priya will find this news story useful.